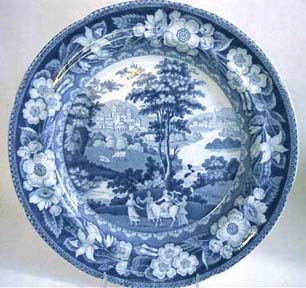 The development of transfer printed decoration on ceramics in England during the last half of the 18th century and its application to blue decorated wares by Staffordshire potters provided good quality table ware for the burgeoning middle class. At that time only underglaze cobalt blue could withstand the heat of the glost ovens and this and the use of glazes containing lead oxide gave the wares the characteristic depth of color and brilliance that made them so successful. Initially, decoration was naively based on Chinese designs, (Chinoiserie). By 1800 European subjects began to appear mixed with Chinese elements. Following the end of the Napoleonic Wars in 1815 there was a trade boom and British and European scenes and subjects became the fashion. Views were taken from the popular books of topographical prints of England, Italy, India and other countries and from popular art works and print sources. Many pieces were made specifically for America. These are generally of a very dark blue color and some are of local American views and patriotic subjects. 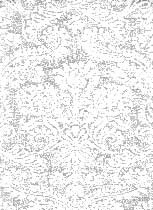 Transferware Collectors Club Database of Patterns. SERVING DISH , rectangle, 12-1/4 inches x 9-1/4 inches and 3 inches high. "Winter view of Pittsfield, Mass". This dish features the famous old Elm (which was cut down in 1861): the building is the Congregational Church (after a fire in 1851 it was no longer in use). Buildings in the background include the Baptist Church, the Maplewood Institute and the Berkshire Hotel. The border has three reserves that repeat the view of the Church. Magrk: Blue printed Clewes and title and impressed mark. STAND, oval 10-1/4 inches by 9 inches. "LONG BRIDGE PATTERN" with pierced basketweave border. Rich dark blue. No marks. Condition good with two tiny chips on basketweave border. TEABOWL & SAUCER, 2 inches high, and saucer, 5-1/2 inches diameter, pearlwar. "Sheep Shearer" rural scene with man in hat kneeling by sheep, holding shears. Floral border. PLATE , 8-3/4"diameter, "Birds & Fruit"pattern . Two birds eating grapes and other fruit from a large fruit arrangement on a table top. Border with 3 reserves of stylized flower and scrolls alternating a floral section featuring a peony. CHILD'S MUG, 3"high. Blue transfer of a Romantic scene featuring a vase of flowers and ornate buildings. Unmarked. JUG/PITCHER, 6" high. "Italian Scenery". With two scenes of a man and a woman standing on the bank of a river with sailing boats. Town and buildings in the distance. Unmarked. Number 25 In blue on base. SUGAR BOX,7" high x 8-1/4" wide. "Ancient Tomb at Boglipore". The scene shows a domed building and palm trees by a river with a boat. The pattern is copied from Charles Forrest's A Picturesque Tour along the Rivers Ganges and Jumna in India. Eagle head handles. Impressed mark. Reference "India on Transferware" by Michael Sack, page 216. PUNCH BOWL, 12 inch diameter by 4-3/4 inch high "Monopteros"; showing The Remains of an Ancient Building near Firoz Shah's Cotilla, Delhi. Based on an aquatint in "Oriental Scenery" by Thomas Daniell. TEA BOWL. "Landing of General Lafayette at New York 1824".The color is a deep blue. There are two images of the ships sailing into New York harbor and two oval panels with the words "Landing of General Lafayette at New York 1824". TEA BOWL & SAUCER. Diameter of saucer 5-1/4". "Moses in the bull rushes". The print shows Pharoah's daughter and her maid discovering Moses floating in his wicker basket. Charming print in rich blue with good detail. Unmarked. Two small areas of enamel flaking to the rim edge of saucer. PLATE, 8", shaped rim, "CASTLE AND BRIDGE" pattern showing a boat with two figures fishing with a net. Interesting border of trees and houses that repeats part of well pattern. Dark to medium blue. Unmarked. PLATE, 9-3/4" "ROMANTIC RUINS" light blue transfer showing a woman traveler on a donkey led by a guide in front of a ruined arch. Floral & foliage border. PLATE, 10", "Wild Rose", named for its border. Shows figures in boats on a river by a thatched cottage with a large house in the distance. Taken from the print of Nunham Courtenay in Oxfordshire. Medium to light blue. Unmarked. SOUP PLATE, 9-12", "Guy's Cliff", Warwickshire. Showing a large mansion by a river with a fisherman and companion. The border has eight reserves each showing a different ruin. Good medium blue. Unmarked. 24059 MORE PHOTOS PLATE , 6- 1/2". Dark blue transfer. Border of grape vine with grapes. Well with framed view of "The Coliseum, Regent's Park" from the London Views series. Mark on reverse. Made for US market. PLATE 10-1/2". From a series of seven scenes from the paintings of Sir David Wilkie. R.A. made for the American market. "The Valentine" a brilliant dark blue. Floral & scroll border. Mark; impressed and titled in blue. Feeding Cup , RARE FORM, lambrequin and garland decoration, the spout showing a landscape with standing woman. There is a stain to the tip of spout and a hairline crack on the top cover. PLATE. 8-3/4"diameter. Egg & dart border and grotto style trees with rose & thistle. "Guildhall, London". Dark brilliant blue, made for the American market. Mark: impressed TAM's circle mark with eagle. SAUCE BOAT, 4"high x 7-1/4"long". "Fisherman's hut" or "Fisherman's return". Made for the American market. Mark impressed"E". Sugar Box & cover, 6" high, 6-1/2" long. Rectangular form with parapet and domed lid. Deep blue pattern, "Couple with Dogs "also known as "The Gleaner and the Gallant" shows a standing man with two dogs talking to a kneeling woman holding stalks of corn. Probably based on a scene from an early 19th century novel or play. Unmarked. . PLATE, 9-1/2", "Batalha" pattern. Batalha is a town in Portugal, 50 miles north of Lisbon. The large building is the Dominican Monastery,which contains the remains of Henry the Navigator. Title in ribbon on reverse with rose spray. DEEP RICH BLUE. Large Tea Bowl & Saucer , 2-1/4" high, 6-1/2" diameter. large flower border. "Herons and Kingfisher" pattern. The print center show two herons by water, with a kingfisher in a tree, in a landscape with a castle in the distance. Unmarked.